← Blue Valentine tinged with misogyny? One would think a film about John Lennon’s teenage years, the tumultuous time when he discovered Elvis Presley and the rock ‘n’ roll rhythms that would govern the rest of his life, would make for a great coming of age story. One would hope that the immense talent possessed by the Fab Four would show up in this film, especially as one of its taglines is “The Untold Story of John Lennon and the Creation of the Beatles.” One would at the very least demand that the characters be recognizable as the geniuses they would become. Unfortunately, Nowhere Boy, a film allegedly about all of these things, possesses none of them. John Lennon wasn’t raised by his mother, but by his far more stable aunt. When he finally meets his mother during his teens, she opens him up to an entire world; a liberated world that isn’t constrained by his aunt’s conservative demeanor; a world of rock ‘n’ roll. 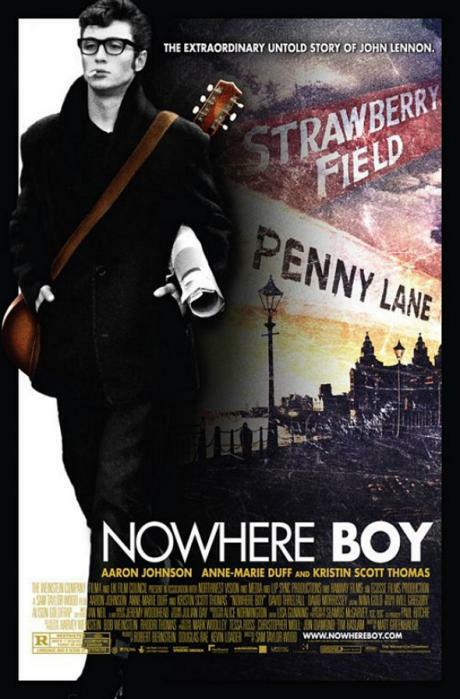 Nowhere Boy revolves around a series of encounters, and growing tension, between Lennon’s aunt and mother. They become dual forces in his life, casting the balance between passion and correctness, fervor and restraint. Along the way, John decides he wants to form a skiffle band called the Quarrymen. The group consists mostly of friends and instead of writing music they mostly cover Elvis Presley songs. There are quite a few good moments in the film, most of which stem from the charisma of Aaron Johnson (as John Lennon) and his ability to emulate Elvis. Eventually, John meets Paul McCartney and George Harrison (there are also casual references to Stu Sutcliffe, one of the many fifth Beatles). While the film makes reference to the band going to Hamburg (where the Beatles would do their first major recordings), we get no resolution on the question of John’s musical career. You go into the film hoping for a portrait of a young John Lennon, and anticipating an encounter with the music that inspired him and the passion it aroused. But all of that takes a backseat to this central struggle between his mothers. Most of the movie is preoccupied with the question of maternity: who is John’s real mother and why? Does his birth mother count even though she was never really there? What about the aunt that has taken care of him, but forces him to listen to Tchaikovsky? Even at the end when John goes off to Hamburg, the focus is on his relationship with his aunt, not with his music. Yes, John had a strong relationship with his adoptive mother and yes, that is worth exploring. But the reason we the audience care about this character is because he is John Lennon. He changed the world, first with his music, then with his activism. He taught us to imagine all the people living life in peace. John Lennon is a person we love, and the character in Nowhere Boy bears little resemblance to that great man. Jean-Luc Godard once wrote in an essay decrying the state of French cinema, “We hate your movies for being so far morally and aesthetically from what we had hoped.” I can enjoy a movie that is mediocre or bad because I expect it to be what it is; I have no greater hopes. Sometimes these films exceed my expectations and those are some of the moments I live for. But the ones that are the worst are like Nowhere Boy. It had the potential to reach into our cultural memory and present something new. It had the chance to explore the ways in which we think about music and its evolution. It could have been a compelling film about the birth and creation of the Beatles. But it was none of those things. If you are a fan of the Beatles and want to watch this, I won’t dissuade you. A simple caveat, though: go into it knowing that it is not a Beatles movie, and has little to do with the John Lennon you know. Maybe it won’t disappoint you as much as it did me. This entry was posted in Reviews and tagged Aaron Johnson, John Lennon, Nowhere Boy, The Beatles. Bookmark the permalink.